In today's nearly completely random episode of Speak Up on Kotaku, commenter Althir believes that this friendly little fellow evokes the same sort of terror as would a flying spider. You folks should write more about games, lest the next one be a giant spider close-up. I'm an arachnophobia. Silly, considering there's approximately three kinds of spiders around here and the most lethal is about as dangerous as a glass of water (room temperature, not carbonated), but there we go. 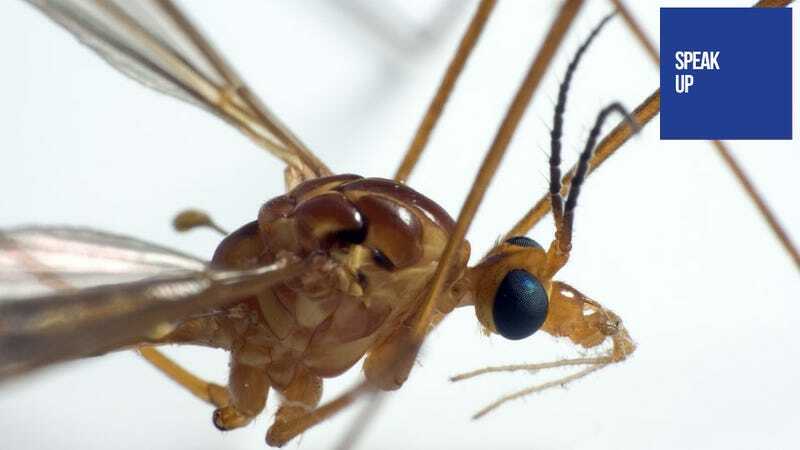 By extension, crane flies are the worst thing ever: They combine the squickiness of spiders (more accurately, the cellar spider) with the ability to freaking FLY, thus there is no way to be safe. The erratic movement doesn't help either. But I found the perfect weapon. For I own deodorant. And a lighter.